Handbrake Tutorial: Is the Free Software the Easiest Way to Rip a DVD? Using Handbrake is confusing from the download, libdvdcss installation to the settings. The common handbrake errors including no valid source found, libdvdcss error and more make things even harder. How to easily rip DVD with Handbrake? Is Handbrake the easiest tool on the market? 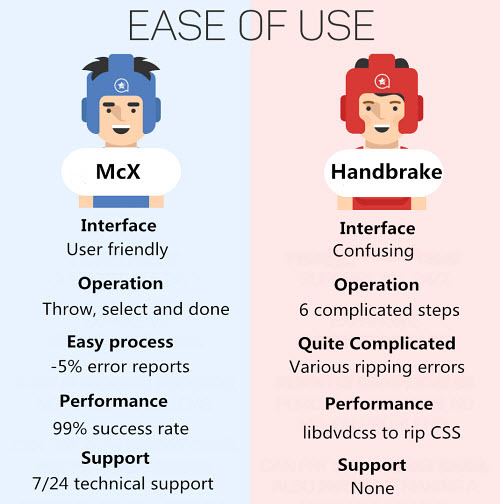 Handbrake has built up a cult following, for sure, due to its open source and cross-platform compatibility. Until now Handbrake for both Windows and Mac has been all together downloaded in excess of 1,562,369 times on CNET, making it the most-recommended DVD rippers among users. But this doesn't mean it's the easiest. Its interface, operations as well as confusing ripping errors has daunted many beginners and some middle-aged and older users. This tutorial will guide you through all the tricky steps and share a 3-step method. Go to Handbrake's official website and download a version based on your computer system. 1. Handbrake is compatible with both Windows Vista - 10, Mac OS X 10.7 - 10.12, and Linux for both 64 bit and 32 bit. Make sure you have 500 MHz processor or better with at least 16MB RAM to make sure the Handbrake version is made for your operating system. 2. For a Mac with a Core 2 Duo or later processor, the 64-bit version of Handbrake is more preferred than the 32-bit version as the former is about 10% faster. You'll also need VLC 64-bit version to rip commercial DVDs. But for those who have the original "Intel Core Duo" processor, you can only download the 32-bit version. After you launch HandBrake, you will be asked to locate a source. You can load Video File, Folder, and DVD Drive. To use Handbrake to rip a DVD on Mac, insert the DVD into Mac's DVD drive and choose the DVD. Handbrake only works with the DVDs that DO NOT contain any form of copy protection. If your discs are encrypted with CSS or region code, you'd better install Handbrake libdvdcss on Mac/PC. 1. To download libdvdcss Windows system, you don't have to rename it to libdvdcss.dll, just keep the file name unchanged and put it in your Handbrake program folder, normally in C:\Program Files\Handbrake. 2. If you are running on a Mac Yosemite or older, just download libdvdcss on Mac and double-click to install it. 3. Downloading libdvdcss on Mac can be tricky as Mac's security feature System Integrity protection prevents the installation of libdvdcss. Get around this with the aid of Homebrew: go to Application > Utilities folder > Terminal > paste the code usr/bin/ruby -e "$(curl -fsSL https://raw.githubusercontent.com/Homebrew/install/master/install)" into the app > press return and follow the instructions to download Homebrew > press Command+Space and search for Terminal to launch a command line window > type in brew install libdvdcss and hit enter. Warning: libdvdcss focuses on helping Handbrake to rip DVD with CSS. But DVDs now are protected with other protections like 99 titles of almost the same length, Disney X-Project, etc. Many users run into Handbrake crashing/hanging problem even with libdvdcss installed. To remove complicated copy-protection scheme, you are advised to find a DVD ripper for Mac with powerful DVD decryption ability for better results. Once the source data is loaded, you will see the Title drop-down menu at the upper left-hand corner. For non-commercial DVDs, Handbrake will select the main title by default. 1. If you want to rip the entire movie, the track with the longest duration is usually the one you shall choose. 2. When it comes to ripping an episode of a TV show in Handbrake, please choose the one with 22 or 44 minutes and kick off DVD ripping separately. Unless you wish to encode a specific range of chapters, you are suggested to leave the chapter drop-down menus at their default values. Handbrake 1.2.2 provides handy presets for general, web, iDevices, Apple TV, Android, Chromecast, Windows mobile, Roku, PlayStation, etc. Choose an output from the right side of the main window. For example, if you'd like to play DVD on iPad, select Apple Device 1080p30 Surround or 720p30 Surround, then rip DVD to iPad on Mac with Handbrake. 1. "General" is better for high-quality playback or fast DVD rip. This is helpful if you want to watch a DVD on the computer. The Fast and Very Fast ensure smaller file size but lower quality while the HQ and Super HD will result in more space occupation but higher quality. 2. Choose the 480p preset when you rip a US DVD and the 576p preset if the DVD is from European. 720p or 1080p won't make the movie look better but only makes the file larger in size. 3. "Web" is good for outputting the ripped DVD movie for easy sharing or emailing, e.g. upload DVD to YouTube. 4. 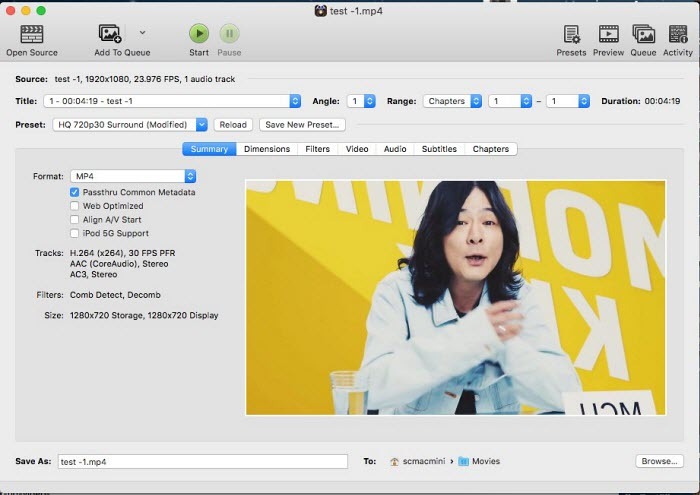 You can use Handbrake to rip DVD to MKV or MP4 (M4V) for free. MKV VP9 encoding is added to Handbrake V1.0.0 and later. You can set your encoding settings manually based on the target device. 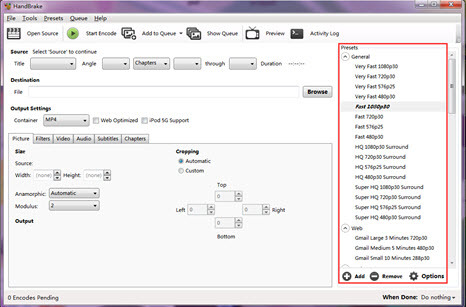 Adjust the output parameters of the picture, video filters, video, audio, subtitles, chapters, etc. to make the output videos more personalized. In this Handbrake user guide, Handbrake video settings, audio settings, and picture settings will be specified to best suit your demand. Adjust Framerate and Video Codec here. when using Handbrake to convert DVD, note that the output quality lies on the size you specify. Remember the higher bitrate, the better quality but the bigger size the output file will be, hence longer it takes to rip DVD with Handbrake. >> e.g. Handbrake iPhone setting to digitize DVD to iPhone via Handbrake. Handbrake supports HEVC/H.265 encoding after 1.0.0. You can convert DVD into MKV encoded with H.265 with smaller size but higher quality. Change the video codec from H.264 to H.265 (x265). This is relatively time-consuming. You can adjust audio tracks and choose the movie subtitle for the ripped content, especially in a foreign movie. You can leave it as default. But if you need to change, note that the audio bit rate shall be below 160kbps if you are ripping a DVD for iDevices. You might as well add subtitles to your foreign film from the Subtitles section. An interlaced DVD will result in horizontal lines in many TV shows of DVD forms. The "Picture Settings" will get rid of interlacing and makes DVD ripping smooth. It also lets you set video resolution and crop video. When cropping the image, there is no preview option. The function of handbrake for Mac is not so practical. After all the settings, the "Start Encode" button on the left top of Handbrake for Mac version to rip DVD on Mac. If you have a source with multiple titles, you can queue these up using the "Add to Queue" button. 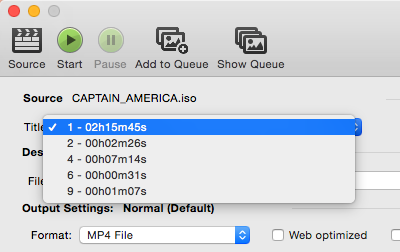 Once your queue is accomplished, click the "Start" button to begin batch DVD ripping process on Mac with Handbrake. Why is Handbrake Not the Easiest Way to Rip DVDs? Are DVD users willing to go through all the steps? 2. 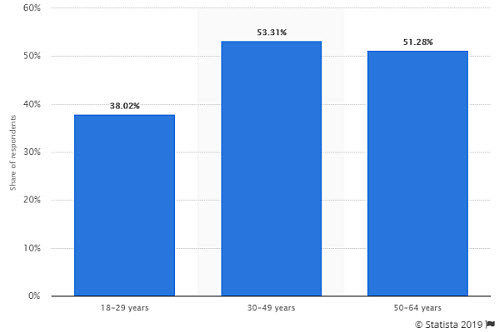 People aged 35-45 are the main customers of DVDs (internal survey). "I need to rip my DVDs to a format for my iPad2. I've tried handbrake, and it's complicated and not working for me." 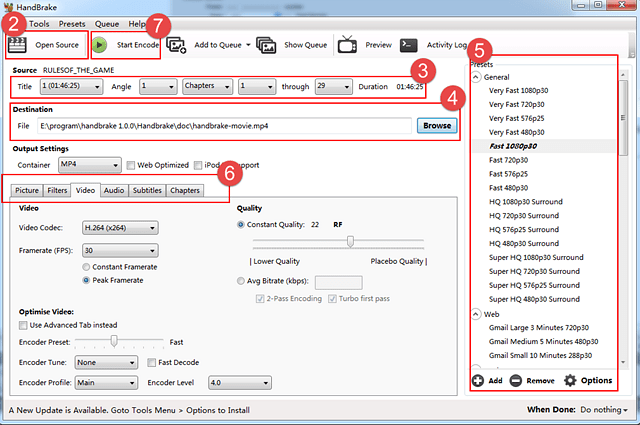 "I found Handbrake to complicated for just converting a DVD to video - too many options." "Handbrake newbie, I need recommended video setting, confused with the settings." "I have difficulty finding a folder recommending Homebrew and just end up confusing the situation even more." "I tried the 1.4 libdvdcss but it's still no good with later DVDs, especially from Disney, like Wall-e. HandBrake is totally confused with these." Will DVD users be able to handle various Handbrake ripping errors? Beyond the tricky steps and adjustments, users are also facing with Handbrake not working problems, such as Handbrake 1.0.7 crashing/hanging/stop loading DVDs issues. Below are some of the most comment Handbrake rip DVD issues from video forums. Can DVD users age 30-64 be willing to deal with those errors? Handbrake no valid source to find error: Handbrake error "No Valid Source Found Error" with protected DVDs. Handbrake won't rip DVD with VLC 2.0: Handbrake fails to rip protected DVD with VLC 2.0 libdvdcss installed. Handbrake cannot read DVD: Handbrake fails to read a copy-protected DVD. Handbrake cannot scan right title: Handbrake scan a multi-title DVD but select a wrong title. Handbrake rips DVD to M4V, not MP4: Handbrake rips a DVD into M4V rather than Mp4. Handbrake won't rip 99-title DVDs: Handbrake crashes when ripping DVDs with 99 titles. Handbrake cannot convert DVD to AVI: Handbrake support MP4 and MKV only, no output video in AVI. Throw DVD, select format and finish the DVD ripping within minutes? If you choose the latter, try MacX DVD Ripper Pro. 1. Straightforward interface with self-explanatory buttons for beginners and non-technical users. 2. No third-party software required to remove copy protections, being able to handle the latest DVDs, Disney DVDs with 99 titles, damaged DVDs, etc. 3. Ready profiles for 350+ lastest iPhone, iPad, Samsung, Android, TVs, YouTube, and more. No need to bother with codec stuff or the like. 4. Three simple steps to convert a DVD: insert the disc > select the format > start to rip. 5. Safe Mode function offers tried-and-true error-free DVD ripping experience. Users don't need to deal with confusing ripping errors. Free download the software on Mac/PC (32bit/64bit both covered). Step 1: Insert your DVD into the hard drive and run the ripper. Then click the Disc button to load it. No matter what DVD (new movies, protected discs, TV series, workout titles...), it will automatically detect its correct title. Step 2: Select an output format. It offers MP4, MOV, HEVC, MKV, AVI, WMV, and other popular video/audio formats. For those who don't want to bother, select the device you want to play the final DVDs on. 350+ profiles are built in with perfect settings. Step 3: Click Run and start to rip. The Level-3 GPU acceleration ensures a 5x faster speed. Some DVD rippers are pretty simple, but they can't deal with 90% of the DVDs, like MakeMKV. It seems that MacX DVD Ripper Pro requires no complicated settings, does that means sub-par performance? No. 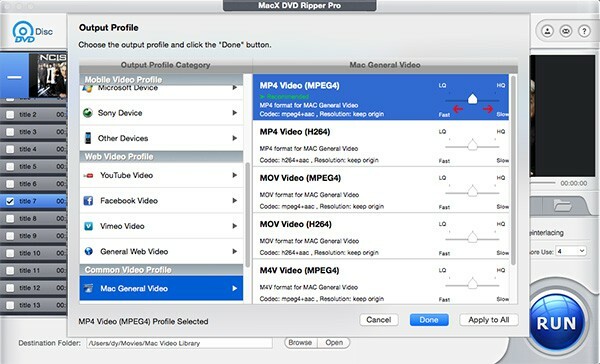 MacX DVD Ripper Pro applies five E's (easy to use, error-free, effective, efficient, engaging) to minimize users' effort with the best results. The 5 Es are powered by a slew of the company's unique technologies. * Easy to use: streamlined navigation and clear button layout will reduce clicks and improve work efficiency. Users can successfully complete the ripping tasks without further help. * Error free: Less than 5% of users report ripping errors. The unique Safe Mode is able to solve most ripping errors that users may encounter with Handbrake or other DVD rippers. * Effective: 99% success rate with any DVDs. The DVD Title Check Mechanism and Analysis Kernel are constantly upgraded to remove the newest and toughest protections. * Efficient: 5x faster speed with Level-3 Hardware Acceleration tech (based on Intel QSV, AMD, and Nvidia), Hyper-Threading, batch conversion, and Multi-Core CPU processing tech. On an advanced computer, it's able to back up a full-length DVD within 5 minutes. * Engaging: 7/24 Tech Support is ready to help users with any problem. The five Es ensures an easier DVD ripping experience while guaranteeing a more powerful performance than Handbrake. 1. MacX DVD has enabled me to back up my entire DVD collection as well as DVD's borrowed from friends. Where an occasional DVD had a problem, the tech support answered my email within 24 hours. It allows me to install and register on a third computer at no additional charge. Awesome! I have some TV series, too! Can't wait for retirement. 2. I got the software as I am interested in a DVD transferring app to copy 120 kids movies onto a wireless hard drive. My grandchildren are careless when it comes to my DVDs. 3. I am a novice, and not well versed on usage of "computer technology". I'm happy with MacX DVD Ripper Pro as it rips the DVD I want without having me sit and read copious notes. 4. The reason I purchased this program was to be able to copy the main movie to a blank DVD so my grandchildren don't ruin the original. I deeply appreciate it. Best alternative to Handbrake to rip any protected DVD to MP4, MKV, AVI, MOV with high quality!